CardXChange is an iPhone app developed byIlliri LLC. If you need a way to quickly exchange your contact info with a friend or new colleague, this extremely slick little app makes sharing your pertinent info a snap! CardXChange runs on the Illiri API. Regular readers will recall that we recently reviewed another app that runs on this API, FotoBeam. We gave FotoBeam a score of 10/10, so my expectations were high going into my review with CardXChange. While FotoBeam lets you quickly send photos between devices, CardXChange is devoted to sharing contact info between phones. Not only can you quickly exchange contact information with another person, you can also record the time and place of the exchange. This is great for people who want to track what conference or city they met a new business contact in for the first time. This app works so quickly. All you need to do is press the “Connect” button. A cute little chirp will play, and then your data will be exchanged. You can try it out with another friend who has the same app, or experiment with the app on the app’s website, where there is a web emulator. 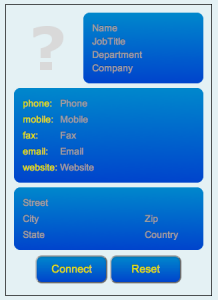 CardXChange isn’t limited to just face-to-face contacts. 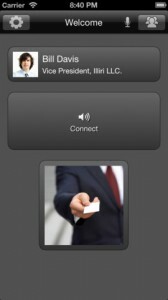 You can also use this app while talking over Skype or a similar video or audio conferencing service. All in all, this free app works great, looks great, and speeds up the process of exchanging contact info. In a flash, you’ll have the other person’s photo, name, position, phone numbers, and more. Best of all, your data isn’t stored on any servers, making you feel more secure. CardXChangerequires iOS 5.0 or later. Compatible with iPhone, iPad, and iPod touch. This app is optimized for iPhone 5.